Blackberry just announced their financial results for Q4 2012 and made a surprising return to profitability. This was achieved thanks to cost cutting measures combined with strong average selling prices (ASP) on devices. The spike in ASP was driven by the Blackberry Z10, shipments of which reached 1 million. 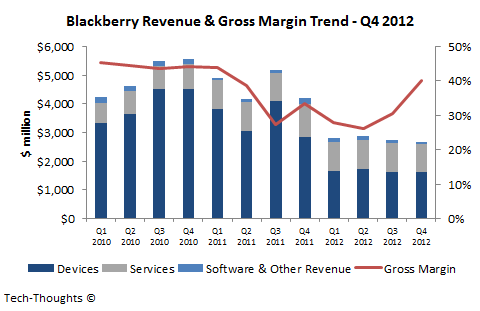 As the chart above shows, Blackberry's revenue has remained relatively stable over the past few quarters. Revenue from devices received a boost from the Blackberry Z10 launch, while the service fee declines haven't yet kicked in. Blackberry Z10 shipments were just a tad below the consensus analyst estimate of 1.1 million, but much higher than my own expectations. These figures match Nokia's Lumia 800 launch, which also saw a staggered release.Even though the Lumia series isn't exactly a rousing success, this does help Blackberry remain financially stable for now. Going forward, the prospects of the Z10 are difficult to predict. Sales have been slowing in UAE, one of Blackberry's strongest markets and in other regions as well. In addition to this, the US launch has been fairly muted so far. 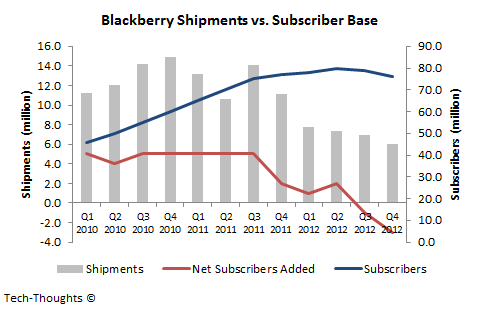 Once the early pent-up demand from Blackberry loyalists is exhausted, the company may struggle to sustain sales growth. However, the upcoming launch of the Blackberry Q10 may generate a fresh demand cycle from loyalists holding out for a QWERTY device. Blackberry shipments (incl. the Blackberry Z10) totaled 6 million this quarter, which is the lowest since Q1 2008. The Blackberry Z10 launch did not help Blackberry stabilize its subscriber base, as it declined by 3 million sequentially. This is the largest subscriber decline the company has ever seen. This is a direct outcome of competition from low cost smartphones in emerging markets, as Blackberry has been quickly losing ground in erstwhile strongholds like India and South-East Asia. I have been extremely critical of Blackberry's strategy with BB10 because it does not address these markets. Delaying the launch of low-end to mid-range Blackberry 10 devices will do nothing to slow this subscriber drop. I expect this decline to continue accelerating over the next few quarters. I expect ASPs and margins on Blackberry 10 devices to decline over the next few quarters, but the launch should give the company enough ammunition to remain stable. This could help drive acquisition interest in the company as well. In the absence of an acquisition, service fee changes to be implemented with Blackberry 10 could put considerable pressure on the company's finances over the next few years.